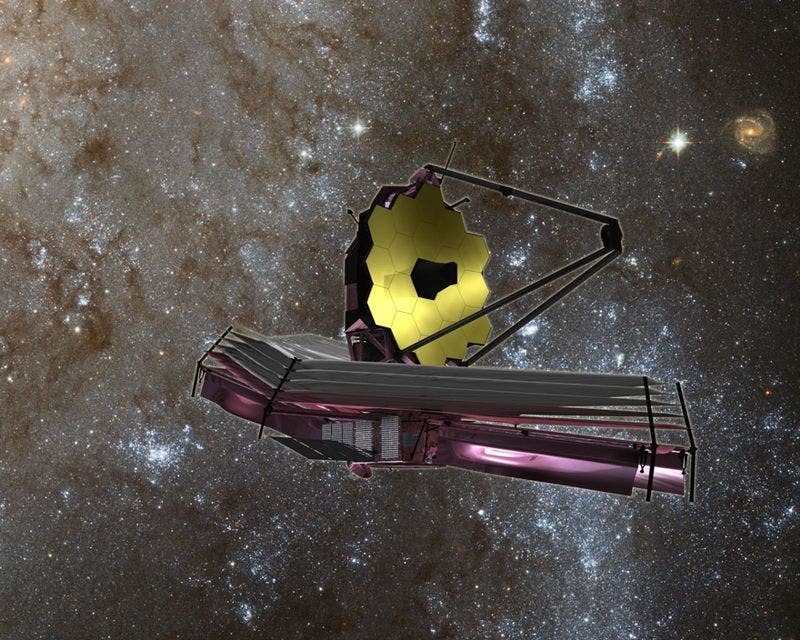 Mission officials for NASA's James Webb Space Telescope, which will be 100 times more powerful than Hubble, announced some of the science targets the telescope will observe following its launch and commissioning. These specific observations are part of a program of Guaranteed Time Observations (GTO), which provides dedicated time to the scientists that helped design and build the telescope's four instruments. "From the very first galaxies after the Big Bang, to searching for chemical fingerprints of life on Enceladus, Europa, and exoplanets like TRAPPIST-1e, Webb will be looking at some incredible things in our universe," said Eric Smith, James Webb Space Telescope Director at NASA Headquarters in Washington. "With over 2100 initial observations planned, there is no limit to what we might discover with this incredible telescope." The Hubble image above shows a distant galaxy that began forming stars just 200 million years after the Big Bang. This challenges theories of how soon galaxies formed and evolved in the first years of the Universe. It could even help solve the mystery of how the hydrogen fog that filled the early Universe was cleared. The broad spectrum of initial GTO observations will address all of the science areas Webb is designed to explore, from first light and the assembly of galaxies to the birth of stars and planets. Targets will range from the solar system's outer planets (Jupiter, Saturn, Uranus, and Neptune) and icy Kuiper Belt to exoplanets to distant galaxies in the young universe. "The definition of observations to be conducted by the Webb Guaranteed Time Observers is a major milestone along the timeline for producing revolutionary science with this incredibly powerful observatory. These observations by the teams of people who designed and built the Webb instruments will yield not only amazing science, but will be crucial in putting the observatory through its paces and understanding its many capabilities," said Dr. Ken Sembach, director of the Space Telescope Science Institute, which will lead science and mission operations for Webb. "I am very pleased that we're at this point since it is now possible for the broader science community to begin selecting targets and designing observations for the Early Release Science program and the Cycle 1 call for proposals, which will be issued this fall," he added.